Brought to you once again by Din and Rishian, and the Zelda Dungeon community, the second official Z-Talk is here! With the close of Majora’s Mask Month, we are back to discussing a variety of Zelda games, topics, and questions. Joining us for this cast are guests, Athenian200, Cooldogs_1, Random Person, and Austin. So, What do you think? Do you think Random Person is onto something with his theory about the dead entities? Do you disagree with Cooldogs_1’s Four Swords timeline theory? You can check out his full forum thread entitled, The Four Swords Dilemma. What are the answers to the trivia questions posed to you? Have you ever noticed the comparisons between LA and PH brought to light today? Do you want a beam sword in SS? Let us know in the comments below! Remember we want your opinions too! If you want to get involved with Z-Talk, you should check out the invitation found on our forums and submit a section to us. We are taking submissions about any of the games, such as your opinions on different theories, issues or simply something in Zelda you enjoy talking about. Also, don’t forget, Din and Rish’s mailbag is always open. 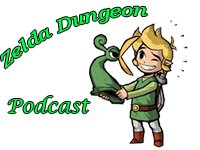 Please send in your Zelda or Zelda Dungeon questions (by clicking here) to have them featured and answered in an upcoming podcast. Also, if you would like to be involved in the Keaton Quiz section of the podcast, you can submit questions and answers to us through the email above and listen for your question to be posed to an unsuspecting guest! Yes, you read that right. We are hoping to expand this section of the cast by inviting guests to try and answer our quiz questions. Fun for everyone; come get involved!